Have you ever wanted to cut a rug with Cinderella’s evil stepmother or stare straight into the glowing eyes of the Headless Horseman’s flaming jack-o-lantern? Perhaps you’ve dreamed of the day when you get to rub boney elbows with Jack Skellington or exchange spookish banter with The Haunted Mansion’s Madame Carlotta. If you are ready for some serious, spine-tingling fun, then let the eerie, rolling fog and the spooky sounds of an un-tuned organ lead you inside Mickey’s Not-So-Scary Halloween party. 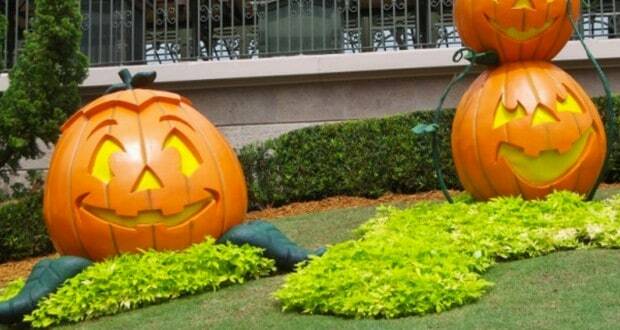 Though brimming with some of Disney’s most sinister villains, the Magic Kingdom is transformed into a HAPPY haunted hollow and there’s no “bones” about it—this event is definitely more fun than frightening! If you have ever wondered about the Mickey’s Not-So-Scary Halloween party and felt torn about the hard-ticketed price, perhaps these 13 reasons to attend will convince you why this event is the hottest ticket in town. Across the park, guests will have the opportunity to indulge in various fall and Halloween themed treats, exclusive to this event. The Main Street Bakery will be serving mummy and candy corn cupcakes. Gaston’s Tavern has a decadently dark chocolate cupcake with a fondant ghost topper. Head over to Storybook Treats and taste the candy corn soft-serve swirl or partake in some candy corn cotton candy available at outdoor carts throughout the park. My personal favorite and definitely worth trying is Sleepy Hollow’s spiced pumpkin waffle sundae, complete with black and orange sprinkles and cinnamon powdered sugar. These treats are wickedly tasty, sure to impress even the grimmest of guests. What’s Halloween without an absurd amount of sugar?! When guests enter the park you will be given a special Sleeping Beauty themed treat bag so you can collect candy from a giant barrel set up at various marked locations throughout the theme park. Your guide will indicate all 13 locations where you will be treated to a generous handful of delicious assorted candy by cast members. There are also some trick-or-treat trails where you will find multiple candy stops along the same route. The treat bags are fairly small so if you are of the serious sweet-tooth kind, then you might want to bring an extra bag for your goodies. Strut your stuff with the likes of famous villains such as Lady Tremaine and the stepsisters, Governor Ratcliffe (from Pocahontas) and Doctor Facilier (from The Princess and The Frog). Located at The Diamond Horseshoe in Frontierland, this club is complete with fog machines, strobe lights, and its very own DJ, dishing out some serious dance-worthy tunes. I could have stayed in here all night, mingling with these crazy characters! This place tends to get crowded (especially just after the parade), but have no fear—the “bouncers” out front limit the number of guests allowed to enter so it doesn’t get too jam-packed. I can’t get over just how seriously creative other guests were in their costumed attire. This alone is almost worth the ticket price! Keep your eyes peeled for some of the most elaborate and inventive costumes, worn by children and adults alike! I spotted an entire family dressed as Star Wars characters, a group of teenagers dressed like the “lost boys” from Peter Pan, a seriously convincing Rapunzel and Flynn Rider, and even Flo from those Progressive commercials. Sporting a costume is not required, but it seriously adds to the fun of it all. I saw guests stopping other costume clad guests and asking to take pictures with them and they were always happy to do so. If the line for Anna and Elsa’s Meet and Greet is simply too long for your liking, there’s no harm in just approaching one of the many convincing look-a-likes for a quick photo-op! From the moment you enter you will feel the slight “chill” in the air as the mood around you becomes foreboding and eerie. The Ghost Host comes over the loud speaker in all his menacing glory welcoming you to his special night. Take notice of the great lengths Disney goes to to get you in the Halloween spirit. Fog bathes certain attractions and rolls past your feet along several walkways. The music heard throughout the park is a Halloween-inspired playlist of spooky songs. Eerie effects like spider-web projections and orange and green glowing trees are everywhere you turn. Disney truly knows how to set the stage in creating subtleties—like spontaneous cackling or howling—that makes this event stand apart from all other Halloween events. Boogie on down once again in Tomorrowland at this frightfully fun dance party hosted by our favorite monsters Sully and Mike. This is a great opportunity for you and/or your little ones to burn off some of that sugar-spiked energy. Unlike Club Villain, this event is outside so there is plenty of space to break it down and show everyone your monster mash. When you first see these guys you may feel the need to take a few steps back at their ghastly and foreboding appearance. But after a minute or so of listening to their corny jokes and Halloween-inspired songs you’ll easily forget about the hatchet lodged in one of their heads and want to be front row and center to this comical act certain to entertain. My personal favorite piece from this corpse-like quartet? Their rendition of Grim-Grinning Ghosts. They are located in Frontierland and are out most of the night, until shortly after 11pm. Don’t miss them! At any given time you’ll find one of these grayish, ghoulish-looking ladies from the Haunted Mansion attraction sitting on a bench on the lawn outside of this ride. They entertain and interact with the crowds with eerie tales and banter, though they don’t do traditional meet and greets. Still, it is a ghost sighting worth spotting! It’s not often you get to pose for a picture with the Seven Dwarfs or the old witch from Snow White. Guests at this event are treated to appearances by rarely seen Disney characters, like Jack Skellington and Sally (from The Nightmare Before Christmas), Jafar (from Aladdin), Lotso Bear (from Toy Story) and many more, and will have the opportunity to take these unique photos throughout the night at various meet and greet locations. Because of the popularity of these characters and the fact that many guests spring for a ticket based on these rare appearances alone, these lines can be quite long so bring your patience with you! The Celebrate the Magic castle display is given a Halloween makeover as awe-inspiring images are projected onto Cinderella’s Castle. The chilling additions include Ursula from The Little Mermaid, Chernabog, the dark gargoyle from Fantasia, and Maleficent from Sleeping Beauty. If you have never experienced this attraction before, do yourself a favor and catch it! I can’t say enough about the creativity that goes into this display—it truly is a spectacular phenomenon that you must witness for yourself! If you’ve seen one Disney fireworks show, you’ve seen them all, right? Wrong! You MUST catch this phenomenal spectacle as the night sky behind Cinderella’s Castle lights up with explosions of breathtaking brightness. The Haunted Mansion’s Ghost Host narrates this fireworks spectacular, and between the sounds, music and booms of bright orange and green light you’ll have the chills in every sense of the word! Hallowishes fireworks show is approximately 11 minutes long and only happens once during the event night so make sure you aren’t stuck inside an attraction missing it! This was by far my favorite experience of the entire night. This Halloween parade is a must-see and not just because it “heads off” with the Headless Horseman galloping down the street with his fiery jack-o-lantern (though this certainly is a reason not to miss it!). The catchy and clever parade music guides float after float of brilliant Disney Halloween mastery, some making you reconsider the “Not-So-Scary” event title. Between the gravediggers’ dance with their scraping and sparking shovels across the pavement to the menacing, zombie-like ballroom dancers, the inevitable goosebumps will have your hair standing on end! In the midst of all the creepy ghoulish parade escapades, there is also a bunch of whimsical, lighthearted fun—including a cowboy/cowgirl hoedown, a candy-themed float led by Goofy (don’t forget to breathe in that strong, sweet candy smell they pump out! ), and our favorite Disney friends donning their very own Halloween costumes! I absolutely adored the skeleton band float rocking out “It’s Good to Be Bad!”and couldn’t contain my excitement as the wicked, unsmiling villains swayed down the street, dripping with sinister superiority. You can wave at them, but they won’t wave back. Mickey’s Not So Scary Halloween party is available during select dates (check the Disney site for available remaining dates) and is held from 7pm-midnight. If you purchase the “hard-ticket” for this event, the park will allow you to enter at 4pm (without having to purchase a separate “day ticket”). There is much to see and experience during this event, so be sure to plan out your strategy ahead of time if you want to catch it all! Full time mommy and writer. I love to eat dessert first and have dance parties in my living room with my two kiddies. I have an affinity for strong coffee, Disney and dreaming up fantastical bedtime stories. I love pointing to the night sky and telling my daughter the crescent moon is the Cheshire Cat smiling at us.